Europe doesn’t only offer a huge cultural variety, but also an immense amount and diversity of delicious foods. One of the best ways to experience food in Europe is to visit one of the many awesome Food Festivals in Europe that take place all year long. In most of those European Food Festivals, you will not only get insights into the local food scene but also in the food culture of other European and non-European countries. Together with some other bloggers, we created this great Food Festival Europe Guide, so you can plan your culinary trip through Europe and visit the Food Festivals 2018 and the upcoming Food Festivals 2019. We also added some food tours and activities in case you miss the food festivals or just want to experience more of the European food scene. Nordic Travellers recommend to visit the Svendborg Food Festival, which came to life in the year 2000, and since then has grown into one the biggest food festival in Scandinavia. Around 140 exhibitors from Denmark, Sweden, Italy and Germany come to Svendborg on Funen every year to flaunt their fresh, quality produce and delicacies. At the festival, you can get all kinds of products. For example oil, honey, vegetables, cheese, wine, cider, fish, chocolate and so on. More than anything the Svendborg Food Festival is about quality, not quantity, which is probably why it is packed with people when it takes place. Who doesn’t love quality food! This European food festival is for adults as well as children, as there are a lot of different food-related activities kids can take part in. Like making sea salt for example. Or sushi. Or learn how to gut a fish. In 2019 the food festival takes place on the 29th and 30th of June. The entrance fee is about 7 Euros, and then you can spoil your palate with tastes form the whole world while strolling around in one of the most picturesque and beautiful cities on Funen. We surely think that it is one of the best food festivals in June. York is a beautiful city in Yorkshire, in the north of England. The narrow streets, gorgeous gothic cathedral and city walls are enough to warrant a visit to the city, but every year in September York is a mecca for foodies when York Food & Drink Festival, one of the best food festivals in Yorkshire, takes over a large part of the city centre. There are stalls selling fresh produce, baked goods, smoked meats, cheeses, artisan gins, wine, every kind of food you can think off, and heaps of street food stalls and a bar or two as well. Fancy a Yorkshire pudding with roast beef and gravy? Done. A beautifully baked cake or a pint of local ale? That too. UK food festivals definitely rock! There are also live cooking demonstrations from local chefs and classes from York Cookery School. Restaurants around the city get involved too with discounts on menus and tastings of their dishes as part of a special foodie trail which takes you around the city sampling the food and seeing some of the sites. The great news is that there is no entrance fee, although there is a small fee for the cooking classes, wine tastings and food trail. All the food you find at the festival is grown, produced or made in Yorkshire, and this top European food festival is a fantastic showcase of British and Yorkshire food, all set in the stunning medieval city. The crowds await the spectacle anxiously. Every year in December hundreds of people brace the winter cold at the Christmas market in the German city of Dresden. The sound of horse hooves clopping against the cobbled streets hint that what everyone has been waiting for is about to arrive: a giant stollen cake! Stollen is a German fruit cake full of nuts, spices and candied fruit, coated with icing sugar. Whilst you can find a loaf of stolen in most German supermarkets and bakeries you will struggle to find one quite as big as the baked good that is paraded through Dresden at the Stollen Festival in early December every year. The Giant Dresden Stollen Cake (Riesenstollen) weighs between 3 and 4 tons! Even the knife weighs 12 kilos and is 1.6 meters long and must be carried by two bakers. This knife is actually based on a real knife from 300 years ago. The tradition of baking stollen in Dresden started in medieval times. The bakers in the city would present the lords with a stollen every Christmas. Even the Christmas market is named after the old word for Stollen, Striezl and is known as the Striezlmarkt. Then, in 1730, August II the strong (August der Starke) who loved pomp decided that the baker’s guild of Dresden would make a giant stollen big enough for all of Dresden’s inhabitants to enjoy a slice. This historic event takes place every year now and is one of the most unique food festivals in Germany. A huge procession of dancers, bakers and chimney sweeps parade through the Altstadt followed by August the Starke himself and the Stollen girl sits on a carriage pulled by four horses with the huge stollen. It is free to attend and takes place on the Saturday before the second Sunday in Advent. Arrive early and on an empty stomach. Enjoy seeing the huge baked good paraded through the old town and make sure you don’t leave without trying a piece of this Christmas treat! The next recommendation, one of the best September festivals in Europe, comes from Nicky from Go Live Young. The Abergavenny Food Festival is an annual food festival which takes place in the market town of Abergavenny in Wales, each September. The festival this year was being held on the 15th-16th September 2018. Over the years the festival has grown to become the National Tourism Awards “Best Event in Wales” 2013/14 and one of the leading food festivals in Wales, attracting visitors from all over the country and from abroad. Around 220 stalls spread across the small town of Abergavenny, with many masterclasses, tutored tastings, kids activities and talks. Over the years the festival has attracted top food heavyweights such as Jamie Oliver, Tom Kerridge, Monica Galetti and Hugh Fearnley-Whittingstall. It offers the opportunity for people from all walks of life to explore and learn about food. The Festival proves itself on transforming the way people think about food, challenging and promoting new ideas and encouraging people to look differently at where their food comes from. Many of Portugal’s most celebrated fun food festivals revolve around a religious event. The biggest festival of all is the Lisbon Sardine Festival, which happens on June 12th every year. The Feast of Saint Anthony in Lisbon honours its patron, of St. Anthony of Padua, who was said to preach the Gospel to the sardines, who dutifully came to the shores to listen to him. Ironically, eating these sardines is now the focal point of celebrating St. Anthony. Sardines are one of Portugal’s most abundant commodities. 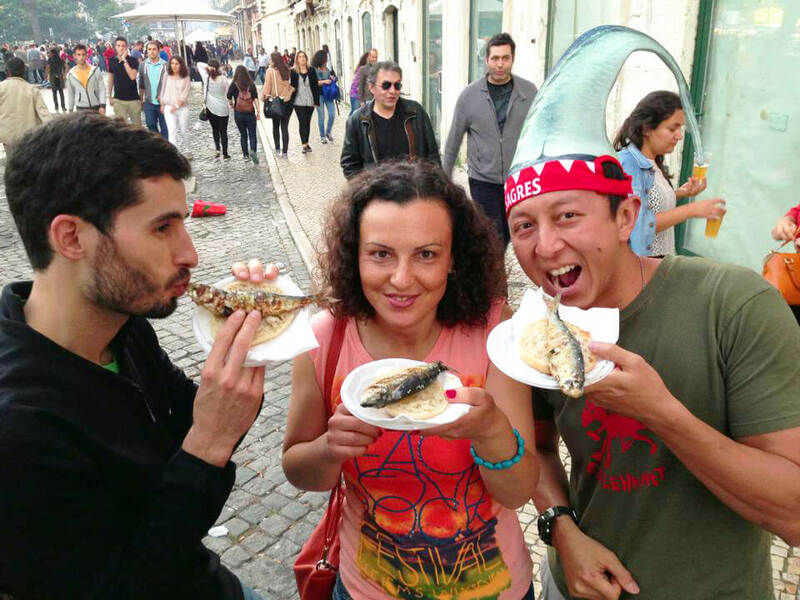 During the Lisbon Sardine Festival, head to the historic neighbourhoods of Alfama and Baixa for the centre of the food festivities. In these neighbourhoods, the thick smoke from grilled sardines fills the narrow streets of Lisbon, where you’ll find hundreds of vendors selling sardines, sangria, and local beer. Definitely one of the top festivals in Europe! If you’re attending while single, don’t forget to rub the Manjerico – a potted plant of basil in the form of a ball that symbolizes newly-sprouted love. You might just find that “special someone” during your visit! As any foodie would know, the best and most authentic foods can be found at Food Festivals Europe. During these, you get to experience a vast range of flavours. Discover exciting new ingredients that you’ve never heard of and try the best of what local cuisine has to offer. I myself have attended one of those food festivals in London, which was called Taste of London back in 2008. It was a definitely culinary adventure where I’ve tried as much food as I could fit into my stomach. Everything was exceptionally delicious. This year, I am planning to go back again to one of the best food festivals in London. Be careful though, opening times vary per day but the festival usually opens its doors to the public around 17:00. The Taste of London is held at Regent’s Park, Outer Circle, London, NW1 4LL. So, you can easily take the tube! The Taste of London is definitely worth visiting – it is one of the best food festivals in England and a highlight of a foodie summer. The Portimão Sardine Festival takes place every year, usually during the month of August. The event takes place along the Portimão riverfront, and attending gives you a chance to listen to local Portuguese bands, buy locally-made products, and of course eat plenty of grilled sardines. It is one of the best festivals in Europe in August. As well as getting to try one of Portugal’s favourite dishes, it’s also a chance to visit a city that relatively few people end up seeing. Despite being the Algarve’s second largest city, Portimão doesn’t attract many visitors as it is located slightly inland from the coast and is not necessarily as picturesque as some of the nearby towns. It is, however, one of the most typical and traditional towns on the Algarve and definitely worthy of a visit. Sardines are a seasonal dish, and the summer is the best time to order them. If you can’t make it to Portugal for this festival or while sardines are in season, be sure to try some of the tinned sardines that you’ll find sold in conserveiras and local supermarkets. Tinned food is taken seriously in Portugal, and often flavoured with ingredients like lemons, oranges, capers, and chillies. It’s so good that it’s often served as is in bars and restaurants as a petisco (tapa). If you love fish as much as we do, then this will be one of the top food festivals in Europe for you. One of my favourite food festivals in Paris is The Best Baguette in Paris contest, organized by the City Council. As you may know, baguettes are very appreciated in Paris so people are very excited to know who will be the winner of this coveted prize. The contest is hard and baguettes must follow very strict rules of size, weight, and salt per kg of flour. There are many baguettes participating in the contest but only a few respect these criteria. The Boulanger who makes the best baguette of Paris wins a prize of 4000€ and the honour to become during the following year the official supplier of baguettes for the Presidential Palace. Usually, the winner’s boulangerie also sees a rise in visits and sales. At least during the months which follow the contest. The Best Baguette in Paris contest is one of the best food festivals in France and is held every year around the end of April /beginning of May (no specific date). The presentation of the prize by the Major of Paris usually takes place during the traditional Bread Festival, which takes place just in front of Notre Dame. Pamela from Travel like a Chieff introduces us to the next highlight on our list of food festivals in Europe. If there’s one thing I never miss, it’s a good food festival. When we moved to Ireland, I looked up all the local Dublin food festivals, and we made sure to attend them all. One of our favourites is the Big Grill Festival that takes place in Dublin’s Herbert Park in Ballsbridge during August. The exact dates for 2019 have not yet been announced, but the festival gets bigger and better each year. This international BBQ festival and competition is filled with fun activities and delicious food. You’ll find bbq ribs, tomahawk lamb chops, corn on the cob, chicken, short ribs, brisket, oysters, desserts and much more. Wash down all the delicious dishes with a nice cold beer, apple cider, whiskey and a variety of other cocktails. Festival-goers must purchase an entry ticket and once inside the currency used is Smokins. Smokins can be bought in stands throughout the park, and these are used to purchase the food and beverages. Entry for the 2018 festival was free before 2 PM on Thursday and Friday, €15 after that and €18 on Saturday and Sunday. We opted for the €28 Whole Hog ticket, which allows unlimited access starting at Noon on Thursday until 9 PM Sunday. Not only will you find fantastic dishes at this Dublin food festival but you will also see live performances, eating competitions and designated areas for children. Bring a picnic blanket, or if you arrive early enough, you can sit at one of the many picnic tables throughout the parc. If you’d rather relax and avoid the queues, Just Eat offers a waiter service where you hand them your Smokins, and they bring the food to you. If you happen to be in Dublin during August be sure not to miss The Big Grill Festival! It’s Smokin! Each year, in the month of May, an annual bread festival is held in Paris on the Parvis de Notre Dame (i.e. the massive square in front of the Notre Dame Cathedral which is also home to Paris Point Zero). A celebration of all things bread related, there’s the opportunity to see pretzel and brioche baking demonstrations, baguette competitions, and even get the chance to sample some tasty bread for yourself. Held on a yearly basis for well over twenty years, what truly makes this one of the best food festivals in Europe is, that there’s nothing quite like stepping into a tent where the scent of freshly baked bread fills the air! Should you opt to visit this free festival for yourself, you’ll likely come away having purchased plenty of bread-related products as everything is just so tempting- you’ve been warned! It’s definitely one of the top food festivals in May! If you are lover ham then heading to the city of Parma in the region of Emilia Romagna Italy in the month of September is an absolute must. Every year the famous factories of the region open their doors and let visitors in to view the process of making one of the world’s most famous hams – Prosciutto Di Parma. The event runs for about 9 days and you can have the opportunity to learn everything there is about this famous ham, it’s history, the strict regulations they have to adhere to be called Prosciutto Di Parma and the unique region that it comes from. If you are a lover of delicious ham, then this is one of the best food festivals in the world! Not only is there ham galore you will also get to try some of the regions other famous products including Parmigiano Reggiano, balsamic vinegar and more. There is also music, arts and craft markets and events to keep the whole family entertained during the event. A must visit for all foodies! Every July, Cardiff hosts a two-day drink and food festival in Europe, featuring over 100 local, national and international producers, pop-up food vendors, cookery demonstrations and live music and family entertainment. The festival takes place in the Roald Dahl Plass at Cardiff Bay and entrance is free of charge. Pick up a bite to eat at the Street Food Piazza, or stock up on ingredients to make your own delicious dishes at home at the Producers Fayre and Farmers’ Market. Make sure you bring a reusable bag to carry your haul. Perhaps also some folding chairs to sit on if your feet get tired – there’s not a great deal of seating at the event! Above all, make sure you go to Cardiff International Food and Drink Festival with a huge appetite, as there’s a lot of food to get through! True enough, Vienna’s Ice Cream Festival on the first Saturday and Sunday of July gathers people from all walks of life like no other event. The official website announces where the Festival will be held. At some point, it was at Vienna’s Burggarten and then at the Augarten, which have 2,000 m² and 522,044 m² of space respectively. It’s the middle of summer. That’s the best way to cool down than having different flavours of ice cream with family and friends! A number of ice cream trucks, tents, stalls, and booths are set up around the area, where ice cream lovers can choose and sometimes have a free taste. A wide range of flavours is being offered by ‘exhibitors’, who could already be established ice cream parlours in Vienna, newly opened ones, and other shops offering ice cream’s famous cousin: frozen yoghurt. There are also options for those who opt for a vegan lifestyle. Mostly based on soy milk, and also protein ice cream for the athletic ones. Creativity also becomes a factor, as exhibitors come up with ways to present their ice cream attractively or aesthetically. You can find choco kebaps, choco burgers, and waffle bubbles, too! We hope that we inspired you with this post to go out and visit some of those fantastic Food Festivals in Europe. There is so much great food waiting only to be discovered by you. If you are interested in more foodie articles, then check out our other food posts.